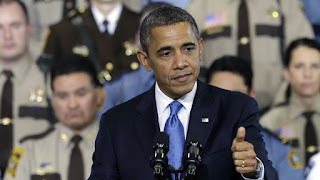 The Backwoods Engineer: How Many Dictators Agree with Obama that Gun Registration is "A Good Idea"? How Many Dictators Agree with Obama that Gun Registration is "A Good Idea"? The real "filter" is Obama's, obscuring the truth about what "universal background checks" really are. The NRA opposes this legislation, because they know what it is: a prelude to gun registration. The historical pattern for "gun control" has always been: 1) Registration, 2) Confiscation, 3) Extermination. No matter what the historical example -- the Vendee of France, the British American colonists, the Armenian Christians in Ottoman Turkey, the Jews in Third Reich Germany, Cambodians -- it does not matter, the pattern holds. Tyrants do not treat populations better after they are disarmed. President Zero and his allies are trying to reach Step 1. They know what they are proposing will not reduce violence, and that isn't their goal, anyway. What they are calling "universal background checks" aren't universal, and don't perform a true "background check", because if they did, it would back up the gun stores so much that the lines would be around the block, not that they aren't now. It should be obvious that criminals do not subject themselves to background checks before buying weapons, but that point is somehow lost on most of the political class. I don't know why. It sure seems like they would be smarter than that. The proposed "universal background check" is nothing but the beginnings of a gun registration system. This should be opposed in every way humanly possible, including with force, if necessary. We will not submit. We will not be scapegoated. We are the people, who give consent to power.